The longest men’s socks in this Viyella men’s range, these Knee High Wool Ribbed Socks are lightweight, with the soft, natural feel you’d expect, but a cool, linen-like crispness too. The wide rib pattern runs the length of the leg and foot, while your underfoot is kept comfortable with a smooth, plain sole. 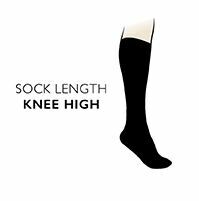 The knee highs have a relatively narrow one and half inch elasticated welt, and are finished with quality hand linked toes for smooth seams and pressure free wear. The same style is also available in short and half Hose versions.